Patrick Messerlin is Chairman of ECIPE’s Steering Committee/Advisory Board, Professor emeritus of economics at Sciences Po Paris, and Director of Groupe d’Economie Mondiale (GEM) at Sciences Po since its creation in 1997. GEM is an independent research unit seeking to improve the performance of French and European public policies in a global world. 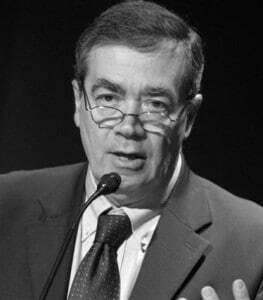 From 1986 to 1990, Patrick Messerlin was a Senior Economist at the Research Department of the World Bank. In 1990, he joined Sciences Po as a Professor of economics. He was also a visiting professor at the University of Houston (Texas, USA), Simon Fraser University (British Columbia, Canada), Johann Wolfgang Goethe Universität (Frankfurt Am Main, Germany) and Keio University (Tokyo, Japan). He has written many books and articles on his areas of expertise. In 2001-2002, Patrick Messerlin was a special advisor to Mike Moore, the WTO Director General. He also served as a member of the Preparatory Conference to the G7-G8 Summits (a group of independent persons gathered by the Peterson Institute for International Economics and the Tokyo Foundation). In 2003-2005, he co-chaired with Ernesto Zedillo, Director of the Yale Center for the Study of Globalization, the Task Force on “Trade for Development” for the Millennium Development Goals of the United Nations. In 2008-2011, he also co-chaired with Ernest Zedillo the joint World Bank & UK Department for International Development Task Force on Global Finance and Trade Architecture. In 2009-2012, he was a member of the World Economic Forum’s Global Trade Council, which he chaired in 2010-2011. During all these years, he has been a consultant to many international organizations, governments and firms. The Success of K-pop. How Big and Why So Fast? Seminar Report – Cultural Industries: Pivoting to Asia?